We’d been in Asia for several months, half the time in Tokyo and the rest split between Vietnam and the islands of eastern Thailand. It seemed a dream to be in America, cruising along the interstate from Atlanta to Clemson. About 20 miles out, we saw the first of the tiger paws painted on the highway and felt the adrenaline rush of entering Tiger Country. The long anticipated weekend was nearly upon us and I couldn’t help but ease the Intrepid over 80. You see, Wake Forest University’s baseball team was in Clemson for a weekend clash of Atlantic Coast Conference powerhouses and my son, whom I hadn’t seen since the previous summer, was Wake Forest’s second baseman. If that wasn’t enough, Wake Forest was having its best year ever and was ranked # 2 in America. Guess who was Number One? You got it, the Clemson University Tigers. So, there we are Friday night in Clemson, watching the pre-game warm-ups - Nicolas fielding ground balls, running sprints in the outfield, taking his turn in the batting cage. Next to me my wife is downing popcorn like there’s no tomorrow, her eyes glued on my son. All the while thousands of orange-clad Tiger fans noisily file into their seats. Nearby, a gigantic back-lit tiger paw stands tall, overseeing the scene. If orange is the color of Clemson, then tiger paws are the heart and soul. Paw prints are on the buildings, the cars, the hats, the sidewalks, the highways. They even have huge chalk paw prints on the baseball field, a few feet before the fence in right & left center. There’s nothing like college sports in America and nothing rivals the frenzy at Clemson University. Maybe that’s because there’s not much in Clemson, South Carolina, besides the university, coffee shops, and beer guzzling joints. A short distance from the baseball field is the football stadium. They call that, The Valley of Death. Clemson is real serious about their sports. The game starts with the Number One Tigers jumping out to a two-run lead. The Demon Deacons of Wake Forest look flat, like they just got off a four-hour bus ride, which they did, and perhaps not worthy of their Number Two national ranking. My son, hitting in the two spot, lines out to the second baseman in his first trip to the plate. In his second at bat, in the 3rd, he’s gunned at first attempting a drag bunt. By the time the 5th inning rolls around, Wake Forest has managed only one hit and continues to trail, two nothing. Still hitting from the left side, Nicolas steps into the box, pumping his bat back and forth, looking ever bit the ball player. Far off in straight away center, the gigantic electronic scoreboard displays, Nick Blue – Fairfax, CA. The moment forever etches my brain, flashing me to the second day of his life. I had walked into town from my house in the hills with the one-day old Nicolas Blue strapped to my chest. The sun’s warmth was a godsend after the long winter, easing our stop at Central Field. “Yes, please,” the blue eyes respond. It was an easy promise to keep. 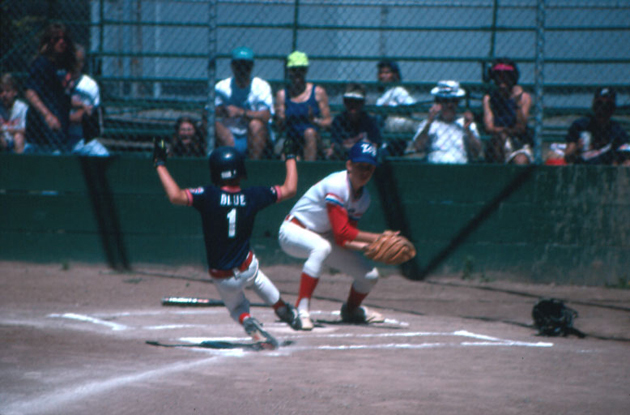 Nicky Blue played in West Marin’s Little League for four years, two in the minors on M&G, and two in the majors on Perry’s Indians, where assistant coach Joe Lorden gave him the nickname, ‘Sparky’. It was a time like no other, and January was extra special. That’s when the ‘Little League Sign-Ups’ banner would suddenly appear over Sir Francis Drake. Teams were forming and baseball games on Central and Nicasio fields were just around the corner. That was big! Wake Forest’s Nick Blue goes deep in the count, fouling off several pitches and taking three for balls. Suddenly, BAM, he sends a shot into right-center. A puff of orange chalk flies as the ball skids across the tiger paw and one hops into the wall. He strolls into second for a stand-up double. I’m on my feet hollering like he just hit the game-winning home run in Yankee Stadium. 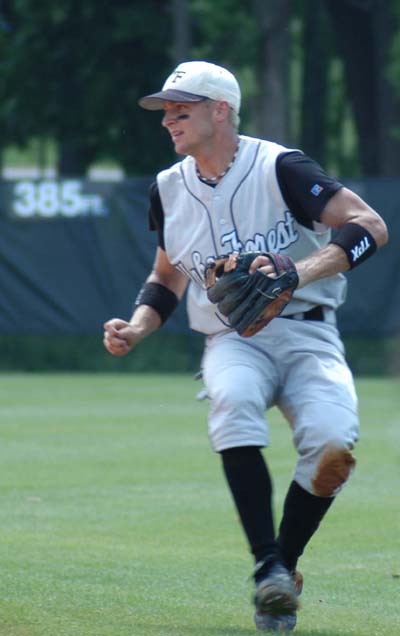 Wake Forest’s next batter moves him to third with an infield out. A fly ball to the outfield puts me back on my feet as my son tags and heads home. In a cloud of dust, he’s… Safe! Wake Forest is on the board. When Nicolas leads off the seventh, the score still stands… Clemson 2, Wake Forest 1. The Tigers have a new pitcher who tosses from the left side so the switch-hitting Blue boy moves to the right side of the plate. Again, he looks at several pitches, waiting for something he likes. KABOOM! He rifles a shot over the first baseman’s head. Without hesitation he rounds first and heads to second, sliding in, beating the tag. An infield out, and he’s on third. A shallow fly heads to left center allowing Nicolas to tag and head home. Headfirst he ties the score, setting the table for his teammates. A single, followed by a home run, and just like that the Demon Deacons have edged ahead of America’s Number One college baseball team, 4 to 2. I forever will have a picture in my mind of the entire Wake Forest team congratulating the player who hit the home run as he arrives at home plate. My son is in the middle, his cheekbones highlighted by black paint, his face covered in confidence. Absolute beauty! In the ninth, ACC’s Player of the Week comes up, hitting again from the right side. As is his pattern, he looks at several pitches, fouling off many before slamming a shot close enough for me to hear it crackle as it powers down the left field line. As fine a hit as his is, Clemson’s leftfielder one-ups him. He sprints over and, with an all-out dive and a fully extended glove, snatches my son’s rocket. Wake Forest won the game, 4 to 2. On that night, a boy who cut his baseball teeth on the fields of West Marin Little League, and with a little help from his friends, had beaten the best college team in America. The following night, Nicolas started out where he left off with a single over the second baseman’s head. Clearly, his plan was to steal second and he led off first with an extra half step. He drew no less than five throws from the pitcher, each time diving back to the bag. On the last dive, he hit hard, and I felt myself wince. Sure enough, he had reinjured his right shoulder, an injury he initially sustained the previous summer in the Cape Cod Baseball League. He kept it to himself, however, and took his position in the field in the bottom half of the inning. With a runner on first, a Clemson player hit what would be a routine double-play ball to Nicolas. He grabbed it, but instead of flipping to short for the first of two, he underhanded the ball to first. His throw went 10 feet over the first baseman’s head, causing a roar of laughter to emerge from the grandstands. He couldn’t go on and came out of the game in severe pain. Clemson went on to win that game and Sunday’s as well. The injured Nick Blue, Wake Forest’s spark, could only watch from the dugout. That summer, Nicolas underwent surgery on his right shoulder. A few weeks after the Clemson weekend, he had returned to the field and even made the ACC All Tournament Team as well as the NCAA Regional Tournament Team. His shoulder, however, continued to bother him so he opted for surgery at the end of the season. Today, a few years down the road, Nicolas no longer plays baseball. Three shoulder surgeries failed to resolve the problem. Considering the majors are dotted with players Nick Blue played with and against, you can only imagine what goes through his mind. 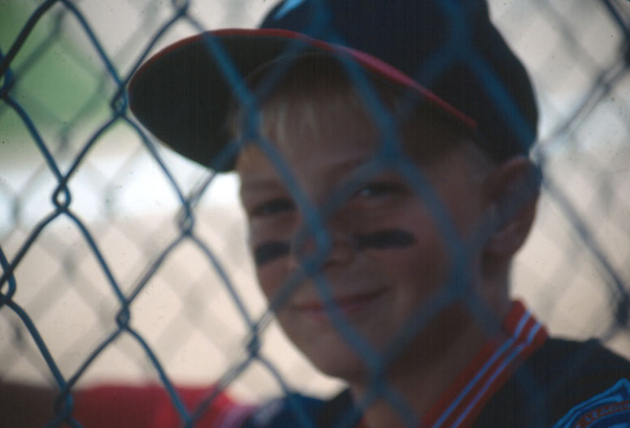 For me, the father who put the ball in the boy’s hand, seeing my son’s baseball career reach a premature end has its own pain. I was there when he hurt his shoulder diving for a ball in Cape Cod, and I was in Clemson. Those memories sting. Still, the joy I received over the years watching Nicolas play baseball far exceeds any negative. Not long ago, I found myself again in the bleachers looking out on a nearly deserted Central Field in Fairfax. Alone on the diamond, Nicolas’ six-year old brother was playing an imaginary game featuring him driving balls off the wall, sliding into third for triples, and scoring runs. Perhaps in reaction to the injury that ended Nicolas’ baseball career, I introduced his brother to golf when he was three and today has a swing most grown-up players will never achieve. Still, keeping baseball out of his life will present its own difficulty – My father was a player, I was a player, and his older brother was a player. Baseball runs in his blood. If that’s what he chooses then I’ll be there hitting grounders, pitching batting practice, and telling him baseball stories. Early on I’ll tell him the one about Clemson when I saw his older brother ignite his teammates to victory over the Number One college baseball team in America.